Buying a walk-in tub is increasingly becoming a must have for homeowners as the benefits outweigh the cost. When you have a loved one with limited mobility having a walk in tub installed will greatly provide safety and comfort for your family member. Walk-in tubs are great if you're disabled, elderly or recovering from recent surgery and are too sore to get in and out of a conventional tub. There are plenty of walk-in tubs to choose from but they are divided by how much you're willing to pay or how much you can afford. Being able to have independence in your bathroom without needing a loved ones assistance is a terrific feeling to add to your new found functionality. When you have a walk-in tub you're replacing your old tub and shower. You will only have to take a small step to get into your walk-in tub and the door securely seals keeping water from leaking out. You simply turn on the water or drain out the water as you sit in your tub. Prices will vary depending on style and what you want your walk-in tub to add to your bathroom, whether you want to feel like a spa or just adding to the property value of your home. 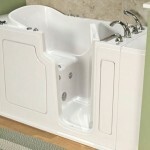 For a regular walk in tub the prices can range from 1,000 to 2,000 not including the fees for installation. And 6,000 - 9,000 seems to be the sweet spot for the fancier walk-in tubs that take you into the realm of a spa-treatment. The installation and delivery may be the biggest cost factor because walk-in tubs are large to ship, so have those fees in consideration when deciding which tubs you can afford. Installation can run you from 2,000 to 3,500 if you hire a trustworthy professional. One of the biggest reasons for consumers looking for walk-in tubs is because of the fatality or injury rate from people slipping and falling in their bathtub or shower. Men and women aged 65 and older made up for a large portion of these statistics. With the walk-in tubs, people have the mental comfort in knowing that they come non-slip preventing many accidental falls. The walk-in tubs also come with a convenient and very helpful grabbing bars. This is a great feature if you're recovering from surgery, child-birth or have back trouble and can't bend in or bend out of a tub. The pressure these bars alleviate from your body provide the consumer with much more ease and comfort for getting in and out. One of the best features of them all is the seating that is also non-slip and most have or can have a padded cushion implemented for extra comfort. Each side of the walk-in tubs have its own seat, so you can't still have some romantic company in the bath with you. Romance doesn't need to dwindle after 65. The last place I want to be found by a team of paramedics is on the bathroom floor covered in my not so covered birthday suit. Somethings are not meant for crowds. Walk-in tubs don't work the same way of a conventional tub, so there will be no sudzing up the bathwater as you get your towel and candles ready. You will need to physically be inside the tub before turning on the water and reverse, you need to be in the tub as it drains. So be sure to not procrastinate and wait until the water becomes cold before you drain out the water. Before you make any plans to install your new walk-in tub do make sure your bathroom is measured correctly to fit the tub and most importantly, that your flooring is capable of holding such a heavy material. These tubs are not light on their feet so if you floor structure is too weak you will want to know this beforehand. A lot of money is involved if these mistakes cause you any problems. It's better to go into this big buying investment with four eyes open. Two in the front and two in the back. Be prepared. The plumbing will need to be checked to make sure it is compatible with your new walk-in tub otherwise the pipe layout will need to be changed to comply with the new model. Make sure your water supply is turned off before any work begins. Do not move any tubs or piping until this step is completed. 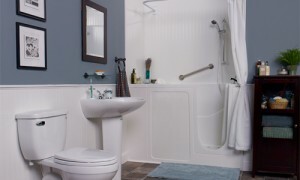 Once your old tub has been removed have the professional slide the new tub in to make sure that all the piping and drain holes are properly aligned as this will prevent any future problems. Once this procedure is finished you want to check for any pressure and leaks. Do proper research on the material your new walk-in tub is going to be made of before using any cleaning products to prevent scratching, damaging or ruining the cosmetics of your tub. 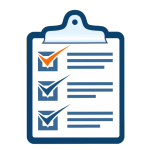 You may also want to check into the kind of water your supply produces, whether its hard, soft or water from your own well. This purchase is not cheap and you will want to make no mistakes. Research. Research. Rinse and repeat before you drop a large amount of hard earned money. And congratulations on taking that not so big step into the comfortable world of walk-in tubs.